David Dow and Sharon Keller are expected to testify on day two of the trial of Sharon Keller, according to the Texas Lawyer blog. 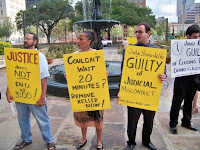 said Keller violated Court of Criminal Appeals procedure in 2007 by unilaterally denying defense lawyers the opportunity to file execution-day briefs after 5 p.m. after she refused to keep her court open late to accept a man’s last-minute appeal. “She should have directed (the request to file late briefs) to me,” said Johnson, who had been assigned by rotation to be the only judge expected to handle execution-day phone calls, faxes and filings from lawyers for the inmate, Michael Richard. Johnson, however, said she didn’t learn about the request for more time until four days after Richard was executed — an account contradicted in parts of a witness deposition revealed Monday. Below are a couple of other news stories from day one. You can also see the videos on YouTube here and here.